From my own experience of trawling the web for a nice easy way to make a Female 40K Eldar Farseer, I know that there’s no shortage of people out there looking for ideas or inspiration. 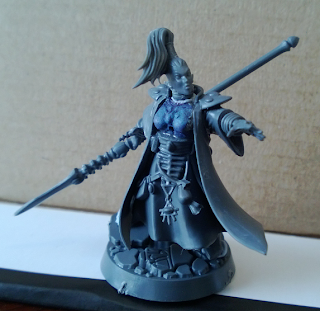 Unfortunately, until recently, most of the suggested ways to build your very own lady psyker have involved a great deal of green stuff work, or resulted in something that didn't really look like a Farseer. Suggestions such as putting a Farseer head on to a Howling Banshee body and green stuffing on a cloak for instance, might sort of work to portray your intent, but I've never felt like they really look the part. I had a Recent visit from my muse whilst looking at the new plastic Farseer sprue on-line to see how easy it would be to do a weapon swap. I noticed that the chest piece was separate, and to me at least, swapping it out for a female Guardian chest plate looked pretty simple. 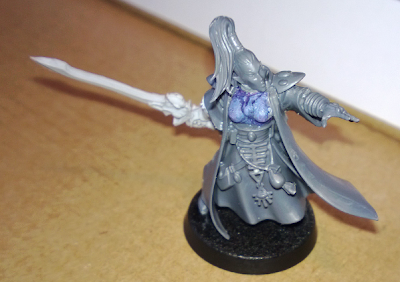 Needless to say I rushed to my local GW this morning to grab a Farseer and begin a critical operation. During this delicate operation I found myself holding out my arm and exclaiming “Scalpel!”, It didn’t work though and I had to pick the craft knife up for myself, scandalous I know. 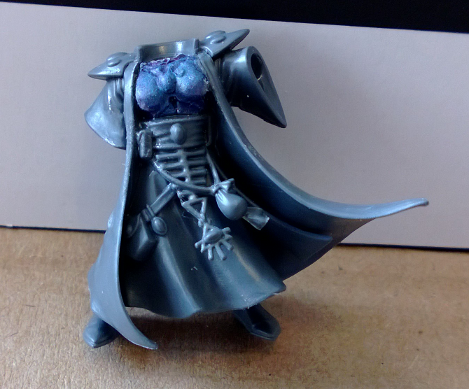 And then work on matching the Guardian’s neck up to the Farseer’s, The indent where the head will go will eventually line up perfectly, however you will have to file off part of the right breast to achieve it. don’t worry, the cloak sticks out far enough to look as though it’s just sitting on top. 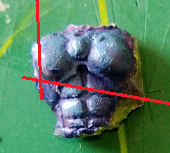 You also need to cut of the bottom two sets of “Abs” and then file it at a slight angle sloping down from right to left. You’ll probably find you are trying to get to something like that, but I wouldn’t take my word for it and cut all that off straight away, take it slow and keep checking the fit. Once the edges were lined up I had to do some shaving on the belt to get it all to fit. 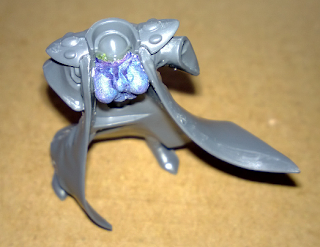 There’s actually a nubbin on the belt that slots into the back of the cloak so it’s easy to line up. 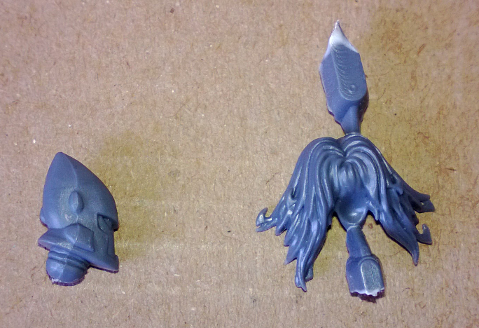 Then some glue and a bit of force to hold it all together while it dried. Obviously you will be getting shot of the mold lines and cleaning her up, but you don’t need me to tell you how to do that. 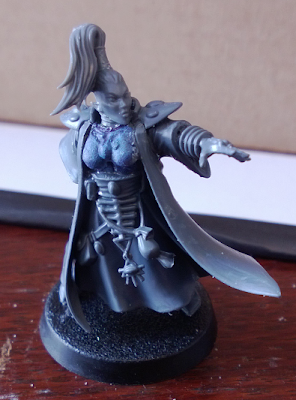 Not being happy with my Farseer still pretty much looking like every other male Farseer out there (only now with breasticles), I set about my normal task of raiding my bits box for ideas to use to set her apart from the rest. With this simple head swap I was starting to feel like my princess was blossoming into a powerful queen. Possibly the queen of my heart. My solution was to take my craft knife, slice the neck off a Guardian helmet and glue it into the Dark Elf neck socket, so the the ball was facing down, it doesn't look like it will work, but it’s quite effective if you line it up right. Stage 3: Simply the Base...t? The next thing I needed to change with my Farseer was her base. 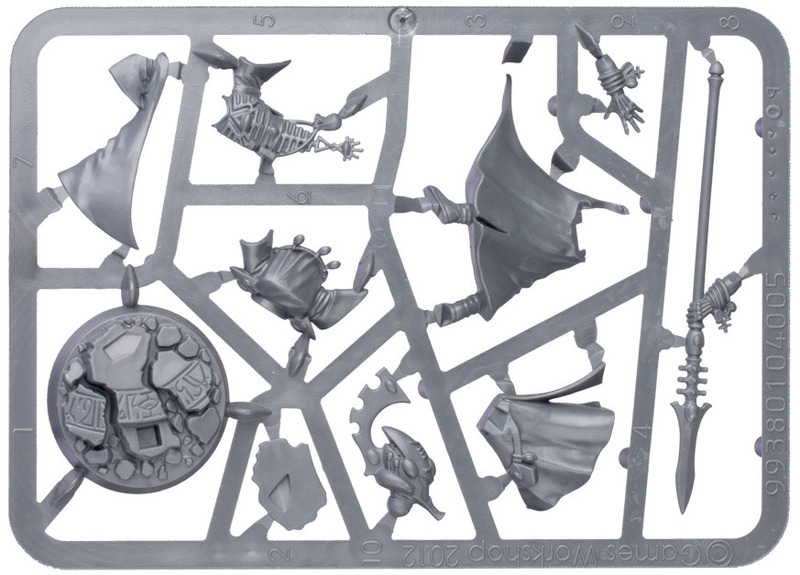 Don’t get me wrong, the new GW plastics character clam packs all come with really great looking bases, and the Farseer is no exception. The problem with them though, is that they are all identical, and do we not decorate our characters' bases to set them apart? 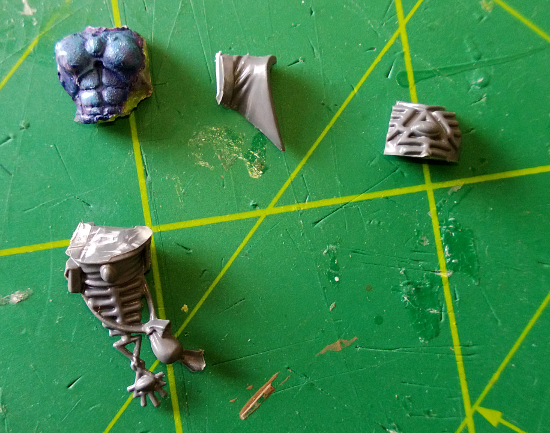 Having every plastic Farseer in existence standing on the exact same bit of ruin doesn't really sit right with me, this feeling is worsened still when there’s more than one of the same base on the same battlefield. Yucky. 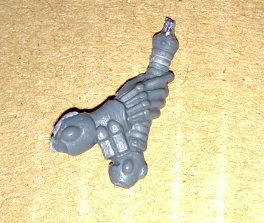 A: Jetbike Autarch sword arm, it’s metal, and not as pretty as B so ruled it out. 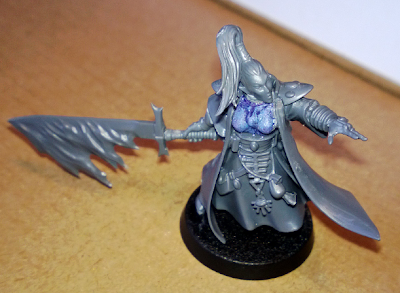 B: Finecast Howling Banshee Exarch’s mirror sword. 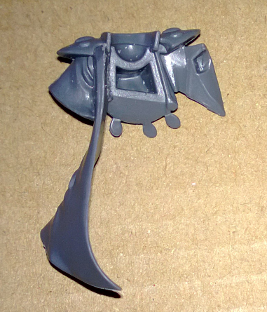 This looked easy to cut to size and could be interesting on the model. 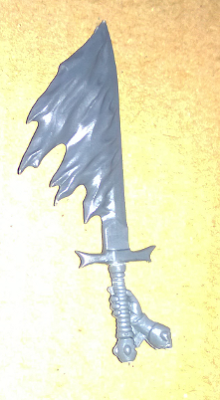 C: The Flaming sword from the WHFB Empire Wizards kit. I was quick to grab this when I stumbled across it in my search because it reminded me that there’s a wargear option for a flaming sword in the new codex. D: Dire Avenger Exarch power weapon. Probably not useful as a whole but I wanted it for the hilt, see later. E: The Singing Spear supplied with the Farseer. 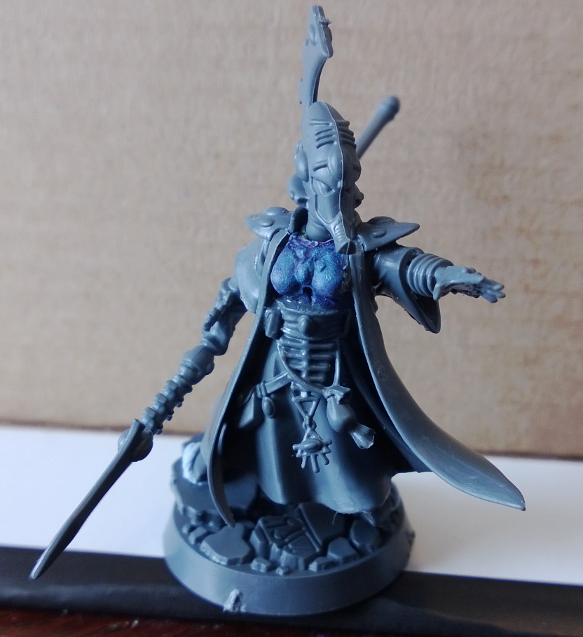 I never take the Singing Spear in my army lists, I don’t really intend for the Farseer to be in situations where the st9 shot would be useful so the 5 points get used up elsewhere. 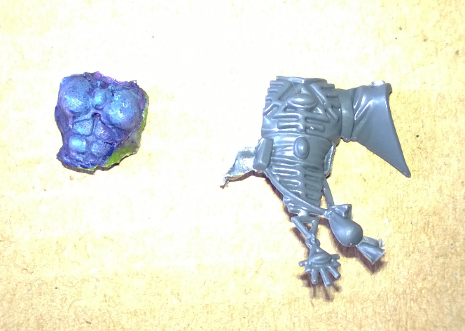 I've included it in the picture for comparison as you can see the arm is fairly stunty so everything else needs cutting down to match. 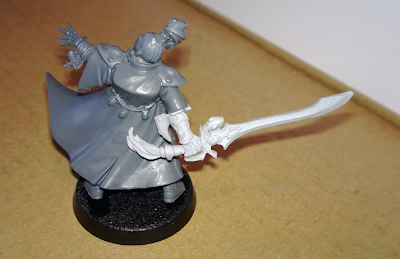 I have some issues with this, the sword is probably too large and unwieldy for an eldar sword, and the guard doesn't really look ornate enough, BUT for some reason I think it still really works. The fluff around the Firesabre, the fact that it gives +1 strength, and sets thing alight sort of makes this look appropriate. And the pose of the model makes it look to me like she’s swinging the sword up towards the target lined up with her other hand. I’d never be able to paint the sword though and I don’t have a list yet with the Flamesabre in, so I needed to explore my other option a bit more. I like the way that the pelt on the Pommel follows the flow of the cloak, I really like the arm blade/guard part and it just looks much more light and Eldary. Quick Lore Comment: If you ever become an Exarch, then you can never be a Farseer. An Exarch is someone who gets lost on their chosen Path and can never be anything else. she can still be a former banshee. Probably started the Path of the Seer right after she left the Path of the Warrior. Very nice done! Also I like her pose! Can you tell me where did you get the burning sword? Basing basics. And some advanced things. Historical Wargaming for the Fantasy Gamer.